This post will set out to determine if we are currently forming a market top by identifying current warning signals and by using past examples, most notably the 2007-2008 market. Calling an exact market top or bottom is fairly difficult and not a task that I aim to succeed at. However, I pride myself on gathering warning signs of a major change in trend whether it is a market top or market bottom. Major tops and bottoms don’t happen overnight and typically take months to materialize. And this is good for the longer term investor – it gives us time to make moves and protect capital. Mr. Market, as some call it, will give the astute investor plenty of warnings as a major change in trend starts to occur, especially at a market top. The market will likely offer head-fakes along the way and this is all well and good provided you maintain your sell stops and follow rules. It can be frustrating to sell prematurely and possibly buy back-in at higher levels than where you previously sold but that is par for the course: simple money and risk management. Let’s take a look at 2007-2008. The market was in a prolonged up-trend from 2005 into much of 2007. The DJIA peaked in July 2007 before dropping quickly to end the summer. It briefly violated the 30-week MA but more importantly, the number of New Lows spiked dramatically, to levels not visited in years (this was a red flag). The NH-NL Diff 10d MA and 30d MA both went negative (July 26th and August 1st, respectively). It was the first time the 10d and 30d Diff had been negative since the previous summer but daily readings were much more dramatic this time around, reaching 500-1,132 new lows. The 1,132 New Lows registered on Thursday, August 16, 2007 was more than Black Monday (10/19/87 when 1,068 were logged – fewer issues on index of course). This was just the first red flag but not an immediate sell signal (watch positions closely, maybe raise some cash to be safe). Following the August lows, the DJIA went on to make new highs in October 2007 and then quickly reversed with another batch of New Lows . The second red flag was the fact that New Highs did not exceed previous levels as the DJIA made a new high, a divergence which is telling. Further confirming this second red flag was the fact that the market once again crashed below the 30-wk MA (November 2007). Please note that the initial red flags span from July to November (4 months = “time”). The third red flag occurred when the market attempted to re-take the 30-week moving average in December 2007 but failed, as New Highs dipped dramatically and New Lows started to creep back up. By January, the NYSE registered another 1,000+ reading (1,114 on Tuesday, January 2, 2008). By this time, the market had dropped more than 2,000 points or more than 15%. Many individual stocks had dropped much more. Sell stops should have been followed and long term investors should have been accumulating cash by this time. Take profits and cut losses when multiple red flags appear (you can always get back in if the correction doesn’t confirm)! 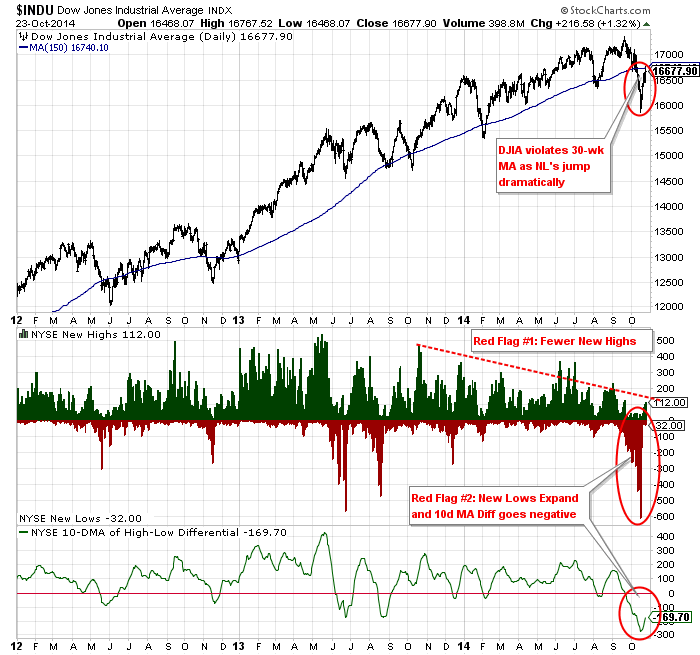 The fourth and final major red flag occurred after the market rallied in the spring of 2008 yet the DJIA could not overtake the 30-wk MA in April and May. Following this failure, the fear and bad news related to the housing and banking crisis were starting to spiral and New Lows confirmed the damage by reaching the greatest levels ever witnessed on the NYSE, culminating with NL’s surpassing 2,000 on two separate occasions, nearly touching 3,000 on Friday, October 10, 2008 at 2,901. 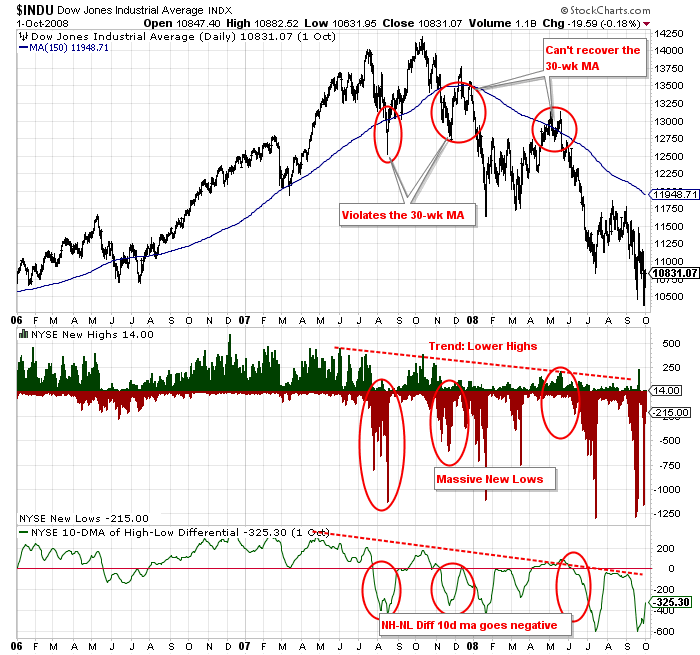 The NH-NL diff 10d and 30d MA went negative on Tuesday, June 10, 2008 and Friday, June 20, 2008 respectively. The NH-NL Diff 30d MA did not turn back to positive territory until Wednesday, April 29, 2009 (essentially as a new up-trend was confirming). The market was still trading above 12,000 in June 2008 so any stragglers could have sold, even at a decent loss at this level. If not, that investor rode the market down to the 6,000’s by October 2008, or another 50% loss (remember, it takes a 100% gain to break even after a 50% loss). Identify Market Tops and Bottoms by Doing this, Guaranteed! Now let’s take a look at 2014! The first red flag has been materializing over the course of the entire year: fewer New Highs as the DJIA makes all-time new highs: a divergence that’s telling (remember this from 2007). The second red flag is the increase in recent New Lows, reaching levels not seen since October 2011 (which was the most substantial correction since the bottom in 2009). Furthermore, the NH-NL Diff 10d MA and 30d MA went negative on September 22nd and October 6th respectively. As of this blog post, the NH-NL Diff 30d MA has been negative for 14 consecutive days and will remain negative for at least another week, based on the figures dropping off and being added to the calculation. It will become the longest consecutive stretch since the correction in 2011 (which lasted 71 days). The 2008-2009 negative stretch lasted 215 trading days (June to April). The third red flag and it’s early, is the fact that the DJIA has violated the 30 and 40 week moving averages. The market is allowed to do this during normal corrections but it becomes a red flag when the NH-NL diff is negative with increasing New Lows (which is the case in October 2014). As of this week (October 23, 2014), New Highs are increasing and New Lows are decreasing but that is normal action as buyers and sellers fight to control the trend. This action is similar to October of 2007 (383 New Highs were registered on Thursday, October 11, 2007). Individual days will swing from time to time so it’s most important to step back and focus on the macro trends that are building. There you have it: several red flags have been logged here in October 2014 so the caution flag has been raised. Just as in 2007, I can’t confirm a new major change in trend will take place but I can tell you to be prepared and watch for additional red flags and respect sell stops. Remember, you can always buy back in if a steeper correction does not confirm. What you cannot do is make up for a large loss if the market starts to free-fall. As identified in 2007-2008, these changes in trend take time so we can be diligent in making decisions but we cannot lose sight that the market has given us a warning. Until told otherwise, this market is suspect so I am in the business of raising cash levels. I am not completely out of the market but I have tightened stops and raised cash. Cash is a position and I know I can always jump back in with both feet if an up-trend continues. I’m just managing risk! 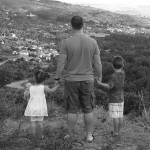 I have added your blog to the McVerryReport.com list of sites I follow. Why not take the money you raise from selling, and buy put contracts instead of holding cash if you think market may fall? Great article Chris. Did we get all of these flags in the 2011 correction? Or is there more flags this time? It will be interesting to see what the market does in the next few weeks. Excellent article! I just posted the link on my Facebook business page Dillon Advisory Services.